It seems like everything is made in China now, doesn’t it? But the one thing that still hasn’t been copied from the US is freedom. 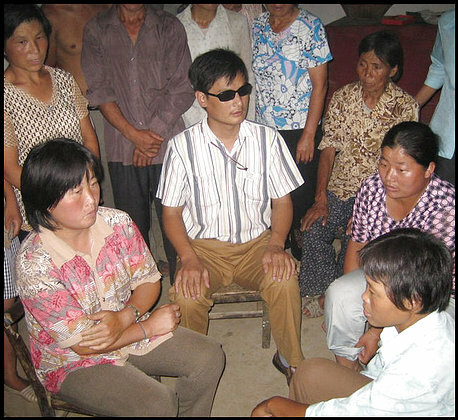 Take for example the plight of Chen Guang-cheng, a blind peasant who was brave enough to expose illegal measures by local authorities when enforcing China’s one-child policy. After filing a class-action lawsuit on the women’s behalf and traveling to Beijing in 2005 to seek redress, several of the local officials were detained. But now it seems that the government intends to “settle the score” with Chen. In March of 2006 he was removed from his house and taken by police, who only bothered to confirm he had been jailed on June 11. 2006. Well, I guess I just blew any chance I’ll ever have of actually visiting China. Because by posting this to my Blog I’d surely be considered a “sympathizer”. And we can’t have any of that now, can we?